our beautiful Grandson is back to school, I am managing to fit in more crafting time !! I'm a very happy little bunny lol. 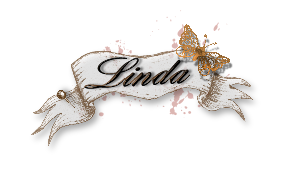 I just love to get in my craft room and just play and let my imagination run wild. I have done a little clearing up in there but not a lot as when I tidy up I just cannot find anything lolls !! it's true, believe me ! As we are all beginning to think of Christmas, I am showcasing a Christmas card which I made for Sue and Harvey of Imagination Craft's in 2012. Use a white base card and colour the edges of the card with Promarkers. Lay the stencil over the card, choosing part of the stencil only and colour that part with a Promarker pen, moving the stencil each time around the card so that the same part of the stencil is around the edge of the card, use a contrasting colour to the background, around the edges. Matt a piece of purple card onto this, slightly smaller than the base card. Onto this matt some gold card, again leaving a small border. Take a piece of white card, smaller than the gold. Colour the edges with distress ink. Lay the stencil on the card and colour the stencil design using Promarker pens. Do this a further two times, each time slightly moving the position of the stencil, so as to get a shadow effect using two more paler colours. Fix this to the base card. in the roof at the base of the chimney on the main image and insert the cut out chimney. Fix the stamped image onto some gold card slightly larger than the stamped image. Fix this to the base card. Glue some blue rhinestones in position, tiny ones in the sky and larger ones around two of the scrolls on the background. Well that's it finished, hope you like it. Have a good weekend everyone and I'll be back soon with another creation. 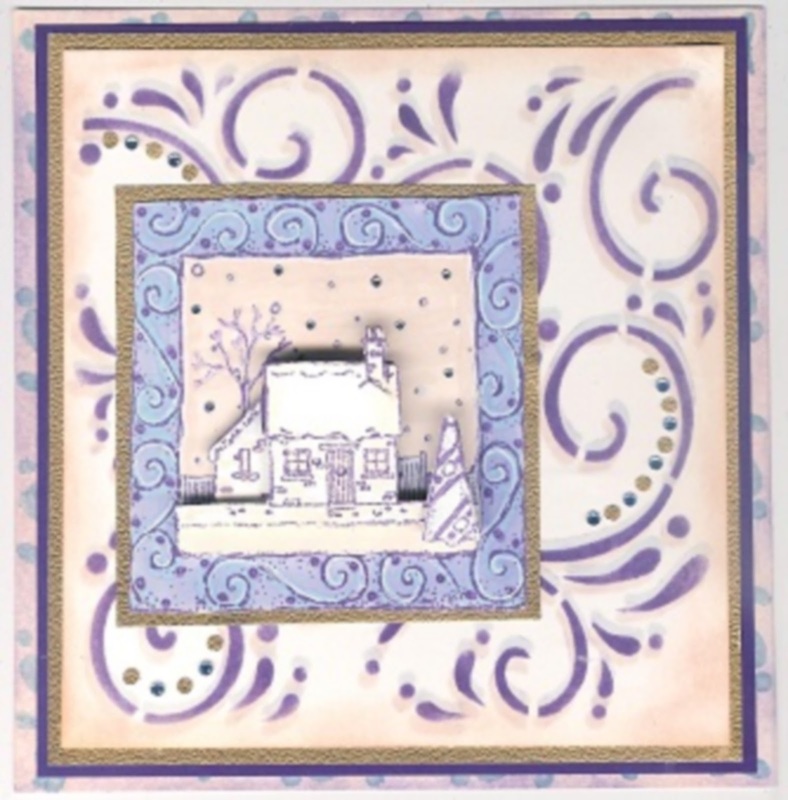 Make a base card from white cardstock. Onto this mat some navy card leaving a border of white showing. Take a piece of white card and using the largest label die, cut a label from the card centre. Put the die cut shape to one side for another project. Colour the card left over after cutting out the die shape with distress inks. When dry, lay the stencil on the top of the card and spread the distress inks through the stencil. Before matting onto the navy card, punch out a semi circle from each corner with a 1" circle punch. Mat this onto the navy card. 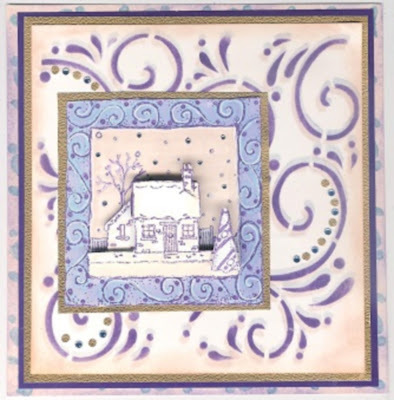 Punch four large snowflakes from white card and glue one in each corner. Mat this onto some turquoise glitter card, then onto some white card, leaving a small border each time. Mat this onto the navy and white base card. Cut a smaller label from white card and colour using distress inks. Rub the white pigment inkpad around the edges of the label and heat emboss using white embossing powder. Fix this to the centre of the base card using sticky foam pads. 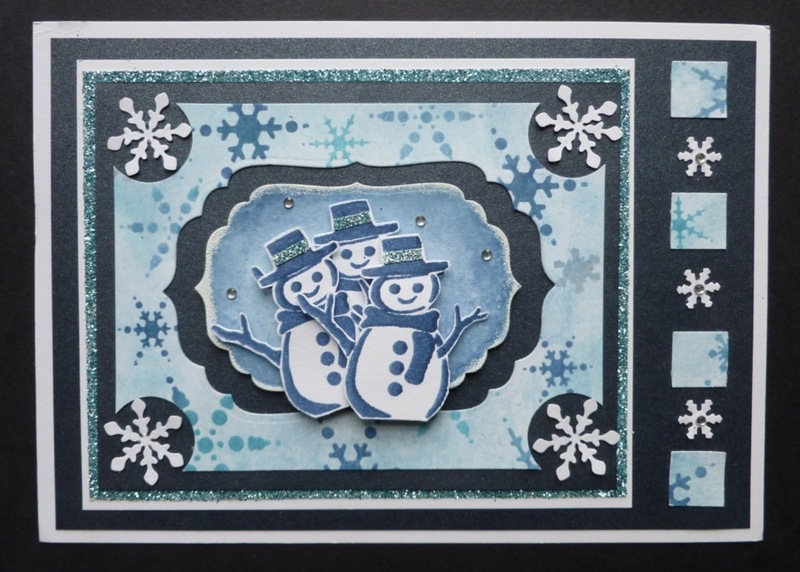 Stamp three snowmen using Chipped Sapphire Distress Ink, cut out and layer onto the label using sticky foam pads. 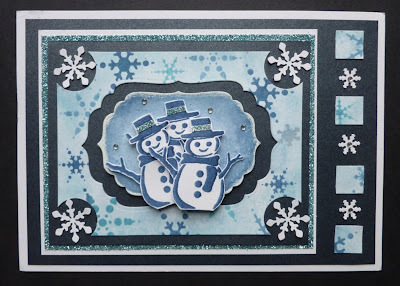 Add some rhinestones to the sky behind the snowmen. 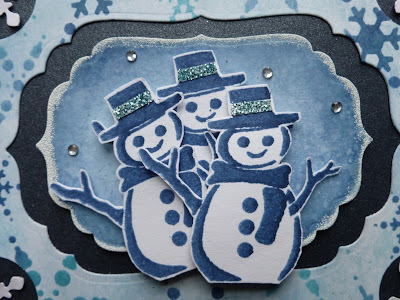 Add a small band of glitter card to each snowman's hat. Punch out four small squares from the left - over stencilled card and glue down the right hand side of the card. Punch out three small white snowflakes and glue in between the squares. Glue a rhinestone to the three snowflakes. 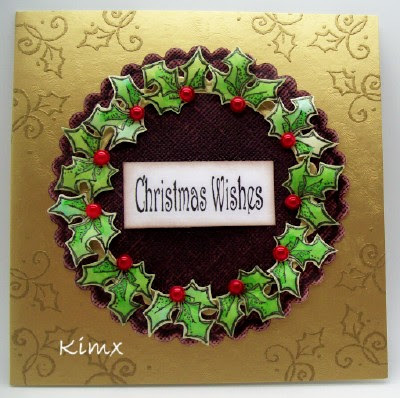 Tonight we are sharing a beautiful Christmas card made by Kim you can visit her blog here. 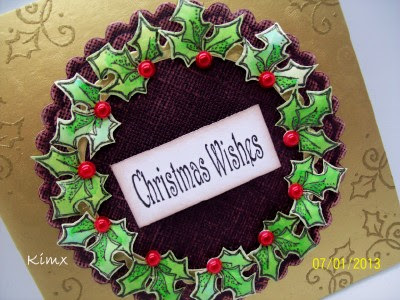 To make the wreath she has used the holly stamp from the Donkey Decoupage Stamp Set from our website. Doesn't this look beautiful and such a great idea.